Many times there are questions about "how to" when making reports to law enforcement. This page is intended to assist you in evaluating situations and making reports to the Forsyth Police Department. You should report any motor vehicle accident that occurs on any public roadway. If the accident is minor (no serious damage, no injuries and no roadways blocked) then it is not mandated to be reported. You can simply trade information with the other involved motorist and submit the information to your insurance company if needed. If there is serious damage and/or injuries, a police officer needs to respond to the accident scene and investigate it. An officer may or may not issue a traffic citation depending on obvious traffic law violations. An accident report is typically available after five (5) business days after the accident. There is nothing fun about getting a traffic citation. There are often questions about how to handle citations once they've been issued. Hopefully you can get some answers here. A citation (ticket) is simply a summons document ordering you to appear in court or dispose of the charges before court. A court hearing date, time and location will be written or printed on the citation. You have the right to hire an attorney or represent yourself during any court proceedings regarding your case. You can typically "pre-pay" the ticket if you choose not to appear in court on the charge. Your citation or other handout given to you by the officer will likely have information so you can contact the court clerk and/or pay the fine. It is always best to consult legal counsel if you have any questions about how to handle your particular situation through the court or by pre-payment. If you receive a citation from a Forsyth police officer for violating a city traffic ordinance, you can call 417-546-4763 and speak with our municipal court clerk. There is often misunderstandings about criminal matters and civil matters. A criminal matter is a violation of a criminal statute or ordinance. A civil matter is a situation where no criminal law has been violated and a law enforcement officer has no authority to act upon it. Common "civil matters" include property ownership disputes, violations of private property policies and regulations (homeowner associations, etc. ), landlord/tenant disagreements, contractual breaches, etc. It's important to remember that if an officer tells you that your particular situation is a "civil matter" it doesn't mean he/she is trying to avoid taking a report, it simply means that the officer has no authority to take action in the situation. In some cases a civil matter becomes a dispute or altercation, at which time law enforcement will intervene when notified. If you see suspicious activities or a suspicious person, please contact law enforcement as soon as possible. It may turn out to be entirely innocent but it never hurts to have law enforcement officers check it out. It's common for people to debate themselves about calling in suspicious activities or persons, but your call can be made anonymously and confidentially. Sometimes people who have been contacted by a law enforcement officer feel they have been either wrongfully treated or given inadequate services. Our officers strive very hard to be professional and thorough in every contact they make. That being said, law enforcement officers know they cannot please everyone in every situation. If you feel that an officer has treated you improperly or didn't provide adequate services in your initial complaint, you have the right to complain about the officer to the Forsyth Police Department. If you wish to file a complaint, you should make a decision whether to file a "formal" complaint or a "non-formal" complaint. A non-formal complaint can be done by completing a complaint form and submitting it to a departmental supervisor. A formal complaint requires, in addition to completing a complaint form, a written statement on official department documents and a visit with a supervisor. Typically, formal complaints are filed by persons who are seeking penalties against the officer in question. In either case, every complaint is accepted and investigated. 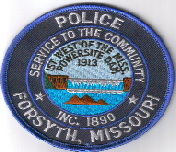 If you wish to file a complaint or have questions about the complaint process, you may contact the Forsyth Police Department at (417) 546-3731 and request to speak with the patrol sergeant or chief of police.